Today (6th August) in São Paulo the Global Alliance for Trade Facilitation and Brazil’s National Institute of Metrology, Quality and Technology (INMETRO) signed a Memorandum of Understanding (MOU) to mark the launch of a new trade facilitation project in Brazil, aiming to boost Brazil’s international trade and implement the WTO’s Trade Facilitation Agreement (TFA). Minister of Industry, Foreign Trade and Services, Marcos Jorge, speaking at the event in São Paulo. Photo: Washington Costa. The project will focus on building a risk management system that can streamline import licensing procedures at the National Institute of Metrology, Quality and Technology (INMETRO). 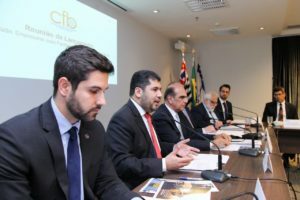 The project will also focus on modernising and upgrading INMETRO’s IT systems – automating data exchange with other agencies and achieving full interoperability with Brazil’s new single window. INMETRO is Brazil’s main national accreditation body, responsible for certifying and licensing goods manufactured in or exported to the country. Government and business developed the project together through the Global Alliance for Trade Facilitation’s public-private approach to trade facilitation reform, as equal partners. By accelerating the issuance of import licenses, this project will sustainably support Brazil’s growing integration into global value chains. It will also help Brazil to implement the TFA, which Brazil ratified in 2016. The project is supported by the Global Alliance for Trade Facilitation, a not-for-profit venture which brings together governments and businesses to identify opportunities to improve trade facilitation, such as reducing delays at borders and removing unnecessary red tape, and implement targeted reforms. “The project we are launching today will lead to tangible reductions in time and cost from the INMETRO licencing regime for businesses. Brazil’s small and medium sized businesses will have greater capacity to take part in global trade. Following the MOU signing an event was held with representatives from the Alliance, government and business to discuss the role stakeholders can play in trade facilitation reform.